Defender Zn - Kenya Biologics Ltd.
DEFENDER ZN is a product developed by FUTURECO BIOSCIENCE for the correction and prevention of zinc deficiencies. It is formulated with a mixture of sugar acid extracts obtained by natural fermentation of wheat, which facilitate the absorption and metabolism of minerals. Inside the plant, the sugar acids are metabolized to generate energy or to be included in the plant carbohydrate reserves (starch). 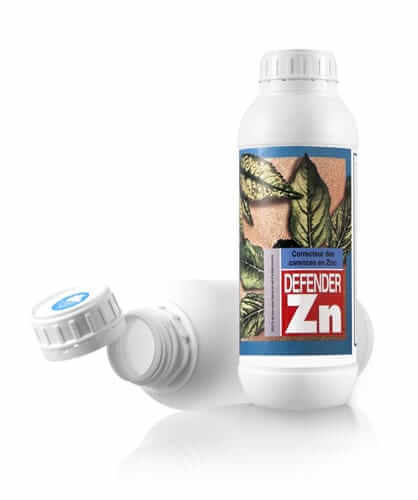 DEFENDER ZN can be used at a foliar level diluted with a minimum expenditure of 300Lwater/Ha. It can also be applied on drip irrigation and hydroponics. The range dose is approximate and optimal doses may be established depending on the deficiencies presented in the soil and leaf analysis. In case of persistence, repeat the dose. DEFENDER ZINC is stable for at least four years since manufacturing date. Store in the closed original container in a cool and ventilated area. DO NOT store for prolonged periods in direct sunlight. Keep away from food, drink and animal feed. Keep out of the reach of children. Use in case of recognized need. DEFENDER ZN is stable for at least four years since manufacturing date. Store in the closed original container in a cool, well ventilated area. DO NOT store for prolonged periods in direct sunlight. Keep away from food, drink and animal feeding-stuffs. Keep out of the reach of children. Use in case of recognised need. DEFENDER ZN is compatible with most fertilizers and pesticides. It is recommended to do a test before applying the product. Suitable for organic farming. *In form of an acidic sugar salt. Citrics 4 – 5 L/Ha In the first symptoms and sprouting. Fruit trees 2 – 3 L/Ha At the falling of petals, sprouting, harvest and post-harvest. Grapevine 2.5 – 2 L/Ha From cluster to sprouting.